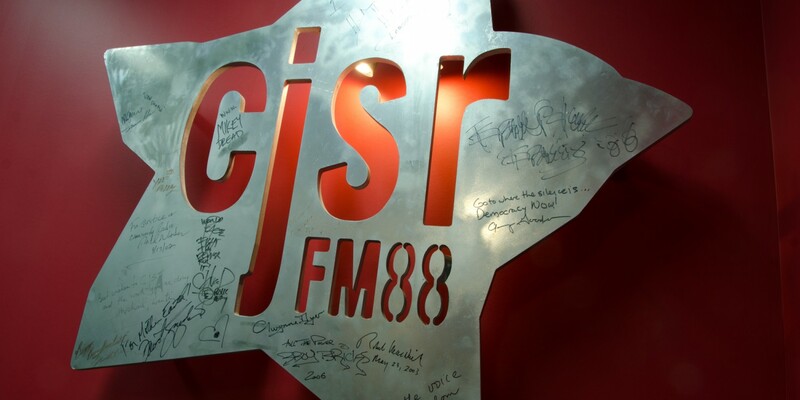 CJSR is a volunteer-run campus and community radio station with a weekly audience of approximately 20000 listeners. We offer Edmonton’s widest range of programming from award-winning spoken word, through cultural shows, our famously eclectic programs and the BBC World Service. Part of our mission is to challenge the status quo and we do it with everything that goes over our airwaves, including our ads. We create everything in-house for a consistent feel and we don’t take ads from just anyone. Also, we have special rates for local bands, non-profits, public service announcements, and local businesses taking part in our Friends of CJSR Card program. To book an ad, email our Production Coordinator or call (780) 492-2577 ext 8. For a faster response, email is preferable. Sponsoring a show will get you nine ads per week: twice during your show and one other time each day. That works out to about 36 ads per month, at only $11 per ad—and Friends of CJSR participants get a 50% discount. Sponsoring a show requires a minimum six-month commitment. Have a big event coming up you want to get the word out about? For the two weeks leading up to your event or gig, we’ll air two ads per day. That’s 28 ads in total at about $16 per ad. Just need a few ads, or don’t want to commit to a timeframe? Why not pay as you go? Each occasion of an advertisement is only $30 using this plan. For national advertisers, there is a flat rate of $40 per ad, with a five ad minimum. For non-profit organizations and student groups with an upcoming event we offer a deeply-discounted ad rate—free. Well, okay, not free: all we ask is you cover the production cost, which is $50. But that gets you the same deal as anyone promoting an event: two ads per day for two weeks before your event. That’s 28 ads total. Are you a hip local band with a new album coming out? Tell the masses with our Rock ‘n’ Roll Special: $100 gets you two ads per day, for two weeks. That’s 14 ads per week, 28 ads in total. Non-Rock ‘n’ Roll acts are more than welcome! Live scripts read out loud by CJSR hosts during their shows (rather than fully-produced ads, which are valued more highly and take more work on CJSR’s end) are available for any of the advertising options at half the rates listed above. Please note, we are happy to discuss alternative advertising methods such as live remote broadcasts. In the case of remotes, we ask that you book the event at least one month in advance. To book an ad or any of these other options, email our Production Coordinator at production@cjsr.com or call (780) 492-2577 ext 8. Do you have a Public Service Announcement?